*If using dry desiccated packet coconut, stream for 5 -10mins to absorbed moisture before using so as cake will not become too dry. 1. Whip egg whites in a clean mixing bowl until big bubbles are formed. Add in the cream of tartar and whip until white in colour. Add in ½ cup sugar in 3 batches, 1/3 at a time and whip until egg whites is stiff. Start at low speed and turn to high speed only on the 3rd batch. This step is crucial. * (watch video how to beat egg white). Set aside. 2. In another bowl cream the butter and add the vanilla vanilla. Beat in 1 cup sugar gradually. Cream well, Then add the well beaten egg yolks. Beat well. Stir in the grated coconut. 3.Sift the dry ingredients, flour, baking powder, salt together and add or fold them alternately with the coconut milk to the creamed mixture. Then fold (not beat) the egg whites into the creamed mixture. Do not over mix. 4. Pour the mixture into a large cake tin and bake at 350° for about 40 minutes. *Grease your cake tin with vegetable oil and dust with flour before pour in mixture. This will enable cake to be easily taken out after baked. 1.Beat the cream cheese and the butter together. Gradually add in the castor sugar. Beat until the sugar is dissolved. This will give you a rather thin icing. 2. 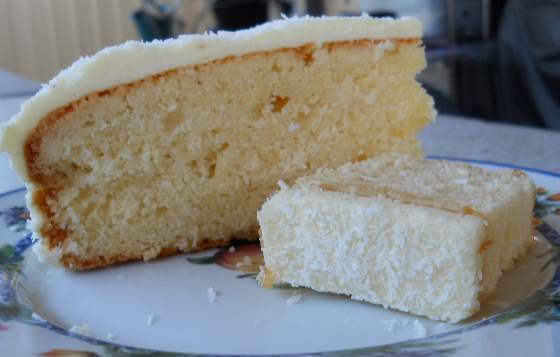 Save the grated coconut after you have squeezed out the coconut milk from the coconut cake. Fry it with sugar over a slow fire until it is toasted to a nice golden colour. Sprinkle this liberally over the icing . Note- Cream cheese may be softened in a microwave oven for 40 seconds ( 800 watts). * or you can use whipped cream or the various substitutes available.